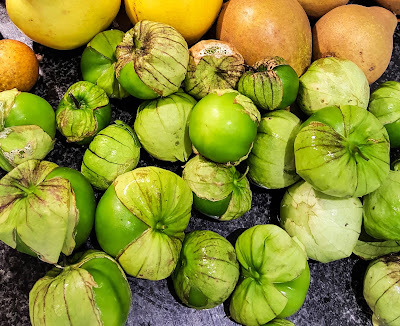 As well as the quince (see below), my other great glut this year was tomatillos, with hundreds of fruit bursting out of their papery husks and dragging the spindly stems to the ground. This Mexican fruit, second cousin to a green tomato but actually more closely related to the physalis, or cape gooseberry, grows exceptionally well in a sunny spot in the UK, so long as you don't plant the seedlings outside until after the last frosts. The fruits swell to the size of cherry tomatoes inside their papery husks, although they remain green. They're ready to pick once the husks are full and firm and beginning to split. The following is inspired by a recipe at Allrecipes, although I've added a few extra ingredients I had to hand. I wanted to combine the tomatillos with the equally Mexican jalapeno chillies ripening in the garden to give the chutney a spicy kick without overpowering it. I can also never resist adding fresh dates to a chutney. They start appearing in the middle eastern greengrocers around here at chutney-making time: they add bulk, texture and sweetness to the final chutney. Dried packaged dates will do just as well although you could use fewer of them to keep the sweetness levels manageable. 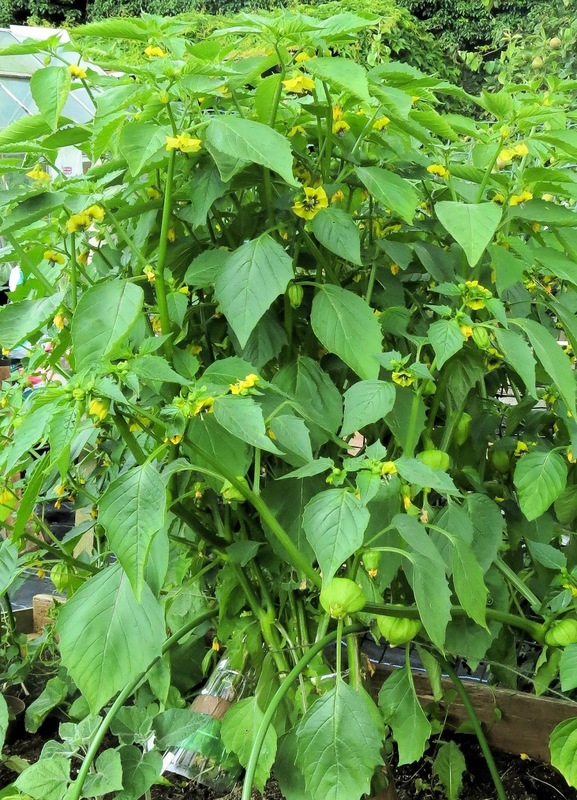 900g tomatillos, or you can mix tomatillos with green tomatoes, or even sneak some red tomatoes in there. Chop the tomatillos, dates, persimmons, chillies, onions and ginger. Put all the ingredients into a large non-reactive pan and heat slowly to start with until the sugar dissolves and the juices are released. Then bring to the boil and simmer for 1-2 hours, until the chutney has thickened and darkened in colour. Check every so often to make sure it does not burn. Remove from the heat and spoon into sterilised jars. Seal and leave to cool before storing in a cool dark place. 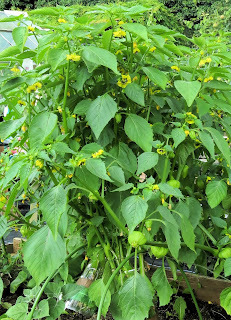 Tomatillo plant showing both flower and fruit forming. This year the quince tree lived up to its name of Meech's Prolific and produced over 300 fruit. After distributing just over half of them to friends and neighbours, I started reducing 150 quinces into goodies for the preserves and drinks cupboard. Over the next couple of months, it became something of a challenge to see how many different ways I could use the fruits. You cannot eat a quince raw: it's as hard as a cricket ball and probably about as tasty. But cooked, gently in syrup, or wine, or roasted long and slow in the oven, it quickly softens. With the addition of sugar becomes meltingly sweet, with a flavour something like a floral apple with a hint of apricot. Cooking with sugar also transforms the colour of the flesh from creamy ivory to warm pink, then amber, and finally, if cooked for long enough, russet red. Quince jelly, an old favourite, made by boiling up chopped quinces with water and little lemon juice and zest, then adding the resulting strained juice to sugar, and boiling until the setting point is reached. Spiced quince chutney. This was a my second attempt at making a quince chutney. The first, made with lemon juice and cardamom, tasted light and citrus-y (unseasonally summery rather than autumnal), but once jarred, had the unfortunate look (and texture) of Pedigree Chum. This new and much more successful version was made using a recipe from Radio New Zealand. Worked just as well this side of the world. Quince cheese, or membrillo, which uses the pulp left behind from making quince jelly, above, pureed and boiled up with industrial amounts of sugar for a couple of hours or until the fruit is almost mahogany in colour. Delicious with cheese, or, if you're my son, cut into cubes and eaten like sweets. Quince liqueur, in the tall jars at the back, or at least it will be once the fruit has steeped in the vodka for about six months. Whole quinces in brandy, also at the back, with quinces in white wine and vanilla syrup at the front. 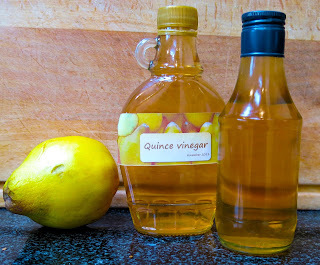 Quince vinegar, on the far right, a slightly sweetened vinegar which makes a light and frsh salad dressing.